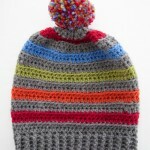 KidKnits: Changing Lives with Yarn! 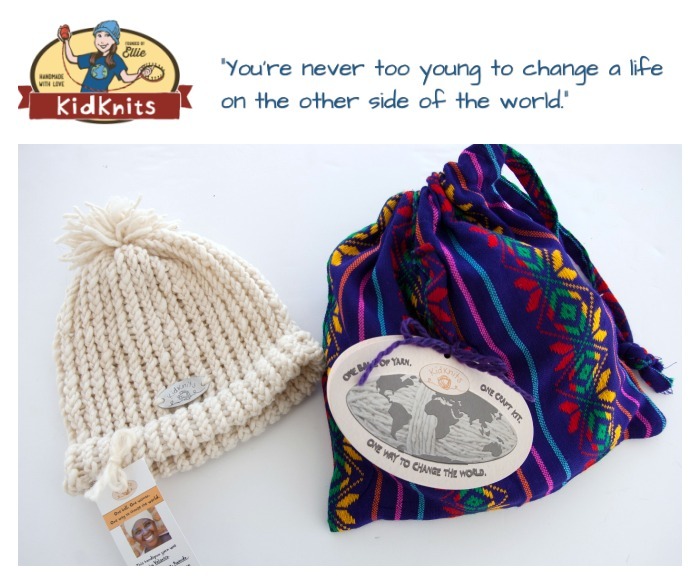 Today I’m honored to be able to tell you about a wonderful charitable organization, KidKnits, that is changing lives around the world… all started by a 9 year old! 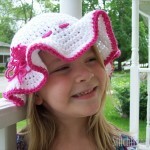 KidKnits.org was started by Ellie of Peoria Illinois, when she was just 9 years old. She had learned to use circular knitting looms in Girl Scouts, and had learned about the plight of the people in Rwanda from her parents. Hearing of a group of widows and their families in Rwanda that was handspinning merino yarn, she got inspired! And KidKnits was born! One sustainable, eco-friendly cotton carrying bag for all your knitting supplies, hand-sewn by the women. One KidKnits logo tag, made in Nairobi, Kenya from recycled aluminum cans. And last night I got to sit down and give it a try! 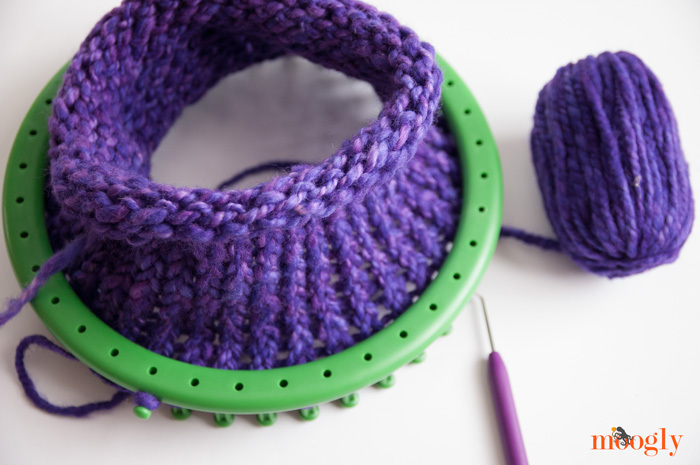 I had never tried loom knitting before, but the instructions that come with the kit made it super easy… and I discovered it’s pretty darn addictive. Definitely a “just one more row” situation! The yarn was lovely to work with too. And Ellie seems to be having a lot of fun with KidKnits as well. Of course, there is a lot of hard work involved! KidKnits is a registered nonprofit, and now her whole family is involved in this wonderful work. And it’s helping so many other families! In Rwanda, there are 35 different women involved in spinning and raising sheep – and now their families have health care, and their children are able to go to school, and the entire local economy benefits. You can read about their work in Rwanda here. 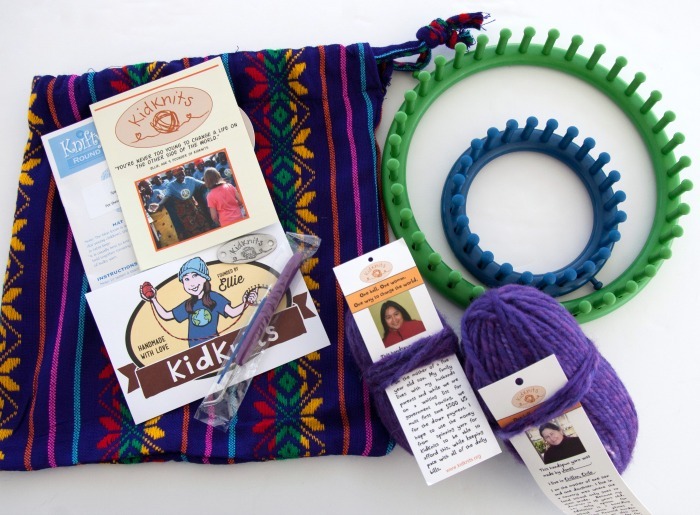 After getting set up in Rwanda, KidKnits was able to spread their work to Chile, where there are now 16 women spinning yarn and taking care of their families. You can read about some of the amazing Chilean women here. I’m so very impressed with Ellie and all the work she has done to help the people of both Rwanda and Chile. As Ellie says, “You’re never too young to change a life on the other side of the world!” I hope you’ll all Visit KidKnits.org and read more about Ellie’s work – and consider purchasing a loom kit from Rwanda or Chile for yourself or as a gift! Thanks for reading! Get Moogly on your favorite social media sites: Facebook, Twitter, G+, Pinterest, Instagram and Tumblr, and be sure to sign up for the FREE newsletter in the form at the top of the page! Help Yarnspirations Make the World’s Biggest Stocking! Child Size Sun Hat by Corina Gray of Stitch11! I have been very curious about loom knitting for about a year and a half, and this seems like the perfect time to try it out. Thank you for the information on a good cause. Thank you for sharing. I have shared this on my page and hope many more will do the same. 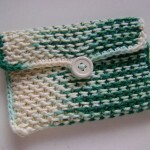 I am a crocheter, not a knitter, but I will have to give loom knitting a try. After all, it is for a very good cause. Thanks again! Thank you so much Carmen! 😀 Even if you cannot buy a kit, just spreading the word is a big help I’m sure! Thank you for sharing this! It looks like a great project to work on with my daughters and maybe my GIrl Scout troop! Just placed an order! I had so much trouble making up my mind, that I ordered a large kit, a small kit, a large skein and a small skein! Split them up between the two countries. I’ve never done loom knitting before, so this will be an adventure. I’m hoping to sell the finished items and use the money to buy more yarn…keep it going! Awesome Darlene! <3 Thank you so much! Thanks for sharing info about such a wonderful organization founded by a young philanthropist! I just placed my first order of yarn, aluminum tags, and workbook! Can’t wait to read it to my daughter and share this with her school. ♥ That’s fantastic Julie, thank you!